We fabricate air flow dampers used in water treatment facilities including potable water treatment and waste water treatment facilities. 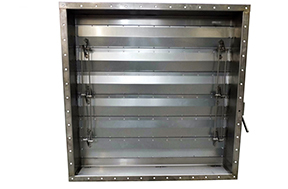 Air flow dampers designed for these environments often require corrosive resistant materials such as stainless steel 316L. All materials and components used in the construction of these DAMPERS are manufactured from 316l Stainless Steel and A4 Grade Stainless Steel fixings. We are often required to fabricate air flow dampers for use in systems that service environments exposed to a chlorine atmosphere such as a Leisure Center Swimming Pools where either a powder coated finish or stainless steel 316L material is required.